We live in a strange world where our children are immersed into everything technology driven. Phones, TVs, tablets, movies, games, books with sounds and moving parts, and even our billboards are digitized. So what does it mean for us as parents that are “digital immigrants” to raise “digital native” children? How do we embrace societal changes while finding a happy medium to allow them to still experience childhood? 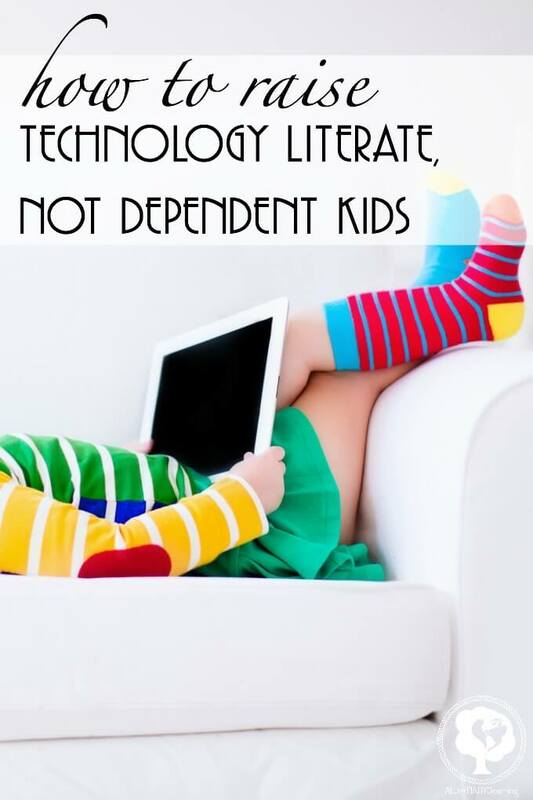 It all starts with allowing children to be technologically literate, but not dependent. Here’s the scary thing. I know there are probably some parents that will read this that are actually digital natives. In fact, I am on the edge of that distinction as well. I was just discussing with my husband that I remember sitting excitedly in the living room of my first home as a child, waiting for hours the first time we got internet. We waited for dial-up and browsed, the very slow web, with netscape navigator. But even peers just a few years after me have no recollection of this and internet has been a very real part of their entire lives. So when technology comes up, I really see both sides of the arguments. I see the benefits of learning with and engaging technology, but I also see the case for slow play and shielding our kids from playing with screens. As parents we all want what’s best for our children. So what is best?! So to be honest, there is research supporting both sides of when to introduce children to technology and how long they should be in front of a screen, but in the end what is best is teaching children to be literate with computers, devices, and technology, but not intellectually, emotionally, or socially dependent on them. Where we choose to view technology as a treat, not a daily necessity. I mean that I have seen my daughter beg for more television. I have seen her throw herself on the ground thinking that Berenstain Bears or Peppa Pig would make her happier. I have seen her tell me she can’t do something and had the ipad cheat and do it for her. I have seen her emotionally lose control because she needed to play a game or watch tv. I have seen her socially choose a phone, an ipad, or tv over friends and family. And that’s coming from a toddler that wasn’t introduced to technology until 2 and have very tight limitations on how often, when, and what to engage with. Try to limit or not introduce television or technology in the early years. 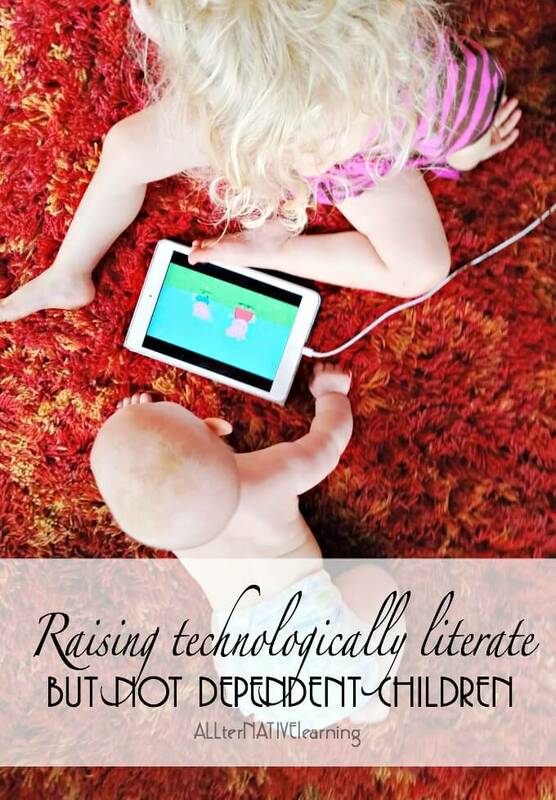 My goal was to not have my daughter watch TV, play with a phone, or be immersed in technology until two years of age. And for the most part she wasn’t. 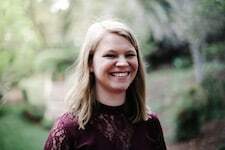 There are a few times that she was for extenuating circumstances or for things like Signing Time that helped her communicate with me even before she had spoken language. In this time, she learned that technology wasn’t necessarily hers, but could be shared with her. And it was a great start for our family. Consider a “child-specific device” and don’t keep it fully charged. We have an ipad mini that is technically mine and I call it my own and am very clear that it’s mine and I am sharing with her, but it is used the most by my oldest daughter. There is nothing on the ipad that could get her in trouble – so she can’t purchase anything, access inappropriate content, or anything of the sort. I can set time limits so that it goes off after a certain period of time, have it locked down in a specific screen, and more. Even though I can set timers, I prefer to not keep it charged. It means when she watches it (about once or twice a week), she watches it until it dies and there is no argument or negotiation that can even take place, because it doesn’t turn back on. Treat technology as a language. It is! It really is. And don’t we all want our children to be bilingual, trilingual, or even multilingual? In today’s society, it is a prerequisite that we understand technology and that we are literate in certain programs. This will become even more a part of the lives of our children. And while languages can be learned at any point in one’s life, it’s easiest when children are younger and introduced by around ages 5 and 6. Carefully choose what technology you share. Clear boundaries for technology are necessary not just for how long and what a child watches or engages with, but also for how a child engages. There is a difference between sitting and watching TV for 30 minutes and sitting, playing brain busters for 30 minutes. We have digital puzzles, digital books and apps, and learning games on top of children’s shows and movies. Set a moving target and don’t be afraid to buckle down or loosen rules on occasion — Technology is a treat to be shared. You have to adjust expectations based on the content and behavior. Sometimes kids can get invested emotionally and socially into a TV show. And in this way children can replace real-life relationships to spend time watching relationships on a screen because they crave more time. These are instances when we scale back television. Or maybe it’s a movie that came out that is supposedly made for kids and is not appropriate. These are all family-specific considerations that get tailored to each child. Furthermore, your life situation might dictate how much technology is consumed in a day or a week. So when we packed to move across country, my daughter got more screen time than I ever wouldn’t have let her under normal circumstances. Such things as watching shows live on television means that kids start seeing kid-geared commercials. This sometimes leads to needed to feel socially relevant in new ways to have all the coolest and newest toys. In our family, we try not to buy into consumerism and materialism, but do try to focus on simplicity and minimalism when possible. We actually do not even own a TV anymore. And we don’t miss it at all. I personally don’t watch almost any shows now even on my laptop because it’s not as easy to access, even though we do have Netflix. I am more content this way and my daughter isn’t asking for the television, because we don’t have one. My husband still watches some stuff that’s live streaming and sometimes we allow our daughter to watch some streaming shows. But we’re choosing what she watches, there are no commercials, and it’s not “just on” indefinitely. 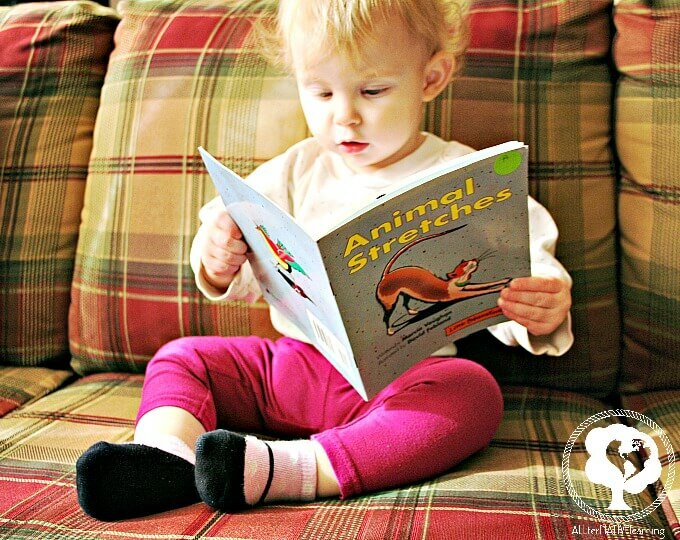 Get excited about books, playing, imagining, and being creative. As my children get older, I want them to be the free thinkers that think outside of the box… and in this case outside of technology. So even though I have never been a reader, I get excited about books for my daughter. I order new books all the time and go to the library with her. I encourage playing before any screen time can happen. I try to foster her imagination and creativity when she is “bored”. And these are the times when i see that she truly is not technologically dependent. We own two things that take batteries. One is a holographic play cell phone that we got so our daughter wouldn’t want our phones and the other is a cloth turtle that plays twinkle-twinkle little star that we got as a gift. Train sets, wooden blocks, tools, dolls, wooden puzzles, sound blocks, musical instruments, and more educational toys. We have them all. And while my child may learn all about being a doctor on a educational TV show, she plays, pretends, and explore what it means 100x more with her toys. Or she may watch an episode of Thomas, but play with her train set 50x more. TV and technology is just a supplement to real life and real play. Sometimes the desire for screen time is just a need to wind down and release energy. Finding time to get outside and spend quality time together build relationships while allowing your little one(s) to play. Allow them to run, jump, climb, play in the dirty, get messy, and explore with their wandering minds. Sometimes, a screen craving is based on desiring visual stimulation. So making some crafts or playing with shapes and mirrors, or doing anything like this is a way to engage the mind without technology. Look at the long-term and end-game aspect of why you’re setting technology boundaries with your kids. Does having a teenager with a cell phone and all of the worst apps scare you? Do you want your kids to be able to solve equations without a calculator? Do you want your kids to be able to have intellectual face-to-face conversations? Do you want to raise hands-on problem solvers? Whatever it is, know what you want for your kids. You’re less likely to cave to a goal or expectation you have set if you are looking at the long-term and not consumed by the immediate short-term.